The fourth in the series, Disgaea is back with quirky weapon descriptions and cheesy jokes which we love it for. This game does not take itself seriously and laughs at itself as we follow the topsey turvey Netherworld. Using old school RPG fighting methods similar to that of Final Fantasy Tactics, where strategy is key to winning. The PS Vita remake is an enhanced port of the 2011 PlayStation 3 title originally named A Promise Unforgotten. The Disgaea games, in my opinion work best on a handheld console as it is easier to grind through stages to level up items/weapons whilst sitting on the train than focusing your free time at home on it. Also the updated version is worth investing in because of all the new additions and changes including extra music tracks, new character classes, DLC and new scenarios ! We are now following a new set of characters – this time we follow a vampire protagonist who is interestingly enough no one in power but a mere Prinny Instructor. He has been landed this role after losing his former strength after a foolish promise (made 400 years ago)to not drink human blood again – and substitutes his blood lust with sardines. This plot filled me with joy meaning the iconic Penguin demons lacky’s are now an integral part of the story. When the government orders the mass extermination of all Prinnies, Valvatorez sets off with his loyal vassal, Fenrich, to stop the madness. The game counts his attempts to overthrow the government and pokes fun at real life politics including some jokes relating to President Obama. Also the politics overflow in to the gameplay now including calling assembly. Any seasoned Disgaea player knows you ‘call assembly’ to unlock new character classes, hidden areas, character strengths. Now via the new ‘Cam-pain HQ’ you can also arrange people on the Netherworld to protect it from Government attacks which also give the user additional stat boosts. Also bribe senators into giving you rare items or abilities and set up your own cabinet where your foreign minister choosing from your own character set list. Also when unlocking new characters you also see them making a vote pledge to gain votes via respectable or corrupt methods, this is another amusing addition to the game. The game has the usual tutorials for explaining each new feature which is worth checking out if you are new to the game. It However the game itself leaves hints within the game. The only drawback with the PS Vita version is it brings nothing new to the series as a whole, no development in graphics we still have the high resolution 2D sprites on 3D backgrounds which makes the game so charming to me but not so much for the modern gamer. This is one of the best JRPG’s on the handheld market holding together a great script with top notch voice acting and a great new cast of characters since the first game. Minor changes to the tactical aspects to keep things fresh and of course new additions to this game including new scenarios/story to follow, unlocking new character classes and lots of DLC. 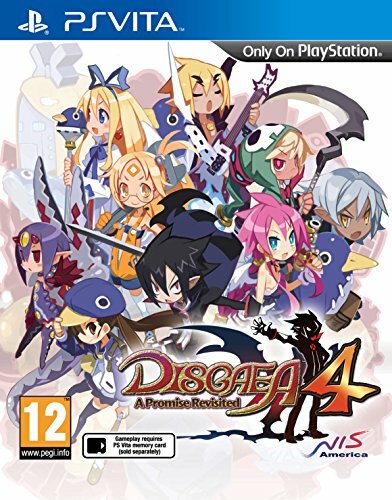 If you want to see development in the Disgaea series Disgaea 5 is what you want to watch out for. Read my review of Disgaea D2 here.